As a year of political upheaval and uncertain prospect comes to its close, I find myself remembering the one and only time I have been involved in a demonstration. This was in no way heroic of me, as it was by accident. I was in Albania and an election was being held. The then miss-named Democratic Party, then in government (as now), was nakedly cheating. A friend, an election observer, then working for the US-based Democratic Institute, came to a rural polling station just outside Tirana, explained who she was, and was heartily greeted with, 'You Democratic Party, We Democratic Party' whilst the hospitable officials carried on stuffing the ballot box! The Democratic Party celebrated their victory (one they could probably have won without cheating, Mr Putin take note) in the main square the following day whilst the O.S.C.E. observer mission thought it politic to withdraw to Vienna before releasing its damning report. "The Spiritual in Twentieth Century Art" by Roger Lipsey is a magnificent book that has done much to shift my understanding of, and appreciation for, 'abstraction' and has illuminated the spiritual exploration that, he admirably argues, underpinned the discoveries of many key twentieth century artists. I thought I would behave like a newspaper and round up books of the year that I have read. I would have to begin with Paul Scott's 'Raj Quartet'. The first time I read it was through a winter in Nizhny Novgorod, waiting upon Spring, and it struck me then as one of the great reading experiences. A novel series of great complexity both in its unfolding historical and personal events and in its psychological depth. Re-reading it, I was struck by the extraordinary portrait of evil that is Ronald Merrick and a portrait painted from 'outside'. We are never given his life and insights, except through the mirror of others: a study in character and its deformation. I had forgotten, also, how much God there is in the text - important to the lives of certain characters, and pondered on more generally. 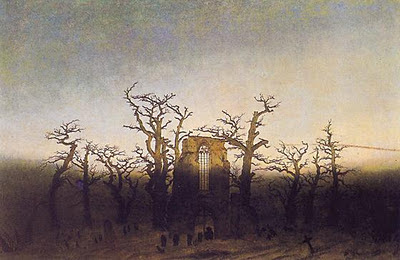 There is a tradition for Christmas Eve that this is a time for ghost stories, like All Saints being proceeded by Halloween, and Lent by Carnival, the arrival of the light and restoration, must be proceeded by the dark and dissolution. Yesterday I was in London, waiting for my new passport to be processed, and so the obvious thing to do on a late, damp Friday afternoon was to go to the cinema. A quick tramp around Leicester Square revealed nothing that was available, starting at the right time, but at an Odeon, in a side street, there was 'The Awakening' just about to begin. Having no idea what this was (there was not even a poster), I bought a ticket and went into Screen 3, where there was precisely no one else! For the first time in my life, I found myself sitting in a cinema on my own! 'Ah well', I thought, 'it is warm...and I have paid'! One of my favourite books of the year was Christopher Rowland's 'Blake and the Bible'. It is a wonderful exploration of how this most eccentric of geniuses interpreted the Bible and in so doing was inspired in the matter of his art. One of his central convictions was that we are all participators in God's image and that this participation extends to all things for 'everything that lives is holy'. If I had one sentence to encapsulate my own credo that would be it! 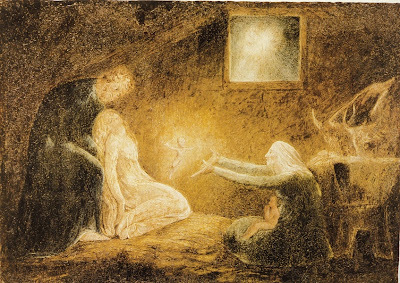 In the course of the book, Rowland explores Blake's strange painting of the Nativity (attached here). William Blake imagined that the Holy Family were both Mary & Joseph and Elizabeth & Zacharias and their off-spring: Jesus and his cousin, John. Having read one novel, burnt into consciousness by being read young and loved, I thought I would read a second whose central protagonist is an artist. This one is even closer to my heart, having being read first when seventeen, when reading was all innocent absorption and assent (or rejection). It is Hermann Hesse's 'Narziss and Goldmund' (and unlike White's 'The Vivisector', I have read it several times, at intervals). The best way to approach Hesse, I now believe, is as fable. Extended and sophisticated as his novels are, they depend on a simplicity of symbolic form that gives them great resonance that removes them from realism. They are, like fairy tales, a genre in which he, also, excelled, archetypal, the characters carry fable before they flesh out in their histories, and it is the fable for which they are charged and memorable. When I first visited Russia, I was taken one afternoon to one of the new markets that had sprung up in Moscow, full of traders, selling everything from cheap Turkish knickers to slabs of dark red-brown meat that slid from plastic bags, that had been stored in battered suitcases, onto makeshift tables. These were the people who were 'making it' hustling through disturbed times with grit and determination and guile. On the edge of the market was a woman in a well-kept fur coat holding a single crystal glass, hoping to sell it, needing to sell it, to supplement the shrunken pension that might not even come. She had been a public, municipal official, we discovered, and her comfortable, pre-fall life, had disintegrated and she was now surviving on meagre help from her equally pressed, public servant children, and selling items accumulated in the 'good times' (of late Brezhnev to which Mr Putin recently referred in nostalgic terms). 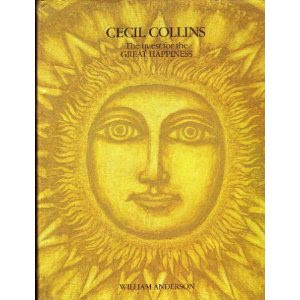 There are moments looking at the reproductions of Cecil Collins' work in William Anderson's exemplary monograph where you glimpse the harmony of the "Great Happiness" that he sought as an artist to convey: its rhythm, its colour, its form. He is a painter of 'paradise' that state of consciousness that is our originator and our end, where all is in its place, and where the light casts no shadow. He is, also, a painter of how messengers of that reality fare in our more conflicted, narrower, less generous world - reminding us that it is the same world, seen differently - seeing that is, at once, fragile, easily lost, and yet when given, paradoxically, is so resonant and strong, such that we wonder how we could ever and again lose its freedom. This strange picture was a highlight for me from an exhibition in the Norwegian National Gallery (from the Art Museum in Berne). Arnold Bocklin was a Romantic painter deeply influenced by the use of symbols (and, as a result, influential on surrealism). It is striking because caught in a moment of Spring, it implies eternity. The two central figures, often described as meeting lovers, come from different historical periods - the woman from that contemporaneous with the artist, the musician from the Renaissance. The two central figures are framed by out-liers: the man (contemporary with the artist) looks out, with his back to us, out into the still lake, standing to the right of the painting. He is painted as if transparent - you see the distant landscape through him. The woman, to the left, with children gathering flowers, is dressed in a long gown, another Renaissance figure, befitting the classical, Italianate villa behind her but plays with children in Victorian dress. In my dimming mind, the Nordic countries share a common history and their cultures resonate with one another and yet like siblings, they emerge with manifold differences - that you can see and feel even in a brief trip through three of them - Denmark, Sweden and Norway. Like siblings, you glimpse the tensions between them. "Perhaps we should do more together," admitted one official in Norway in response to our innocent query, before his body relaxed into the transparent thought that he was glad that they did not! My colleagues plump for Stockholm. It is manifestly 'cool' - the way people dress, the greater racial mix, the range of shops especially those unique to Sweden; and, the balance of old and new: a carefully preserved old city blending into a more modern whole. Paintings at an exhibition, seen briefly! A fleeting visit yesterday, between meetings, to the National Museum in Stockholm and what do I find but an exhibition of paintings from Russia - from the Tretyakov and St. Petersburg - of those now deeply familiar artists from the late nineteenth century including my favourite Russian painting: The Little Fox by Mikhail Nesterov of a fox tamely emerging from the woods of northern Russia to greet three elderly monks, benignly enjoying each other's company sitting on a log. It is a beautiful painting of contemplative ease in which a glimmer of paradise is restored, now and here, in the renewed compact between nature and human. The recent controversy about Mr Clarkson's remarks about shooting public sector workers in front of their families reminds me of one of the more surreal moments of my life. I was being driven down a very, very steep slope in Tuva in Siberia in a 'rugged' Russian 4x4 as the first snow of winter sprinkled fitfully down. The driver was talking about 'Top Gear' which, apart from the smoggy streets of London staple of Russian 'English' text books and Princess Diana, was the only piece of England to have made any impression. Indeed the only time I have ever watched 'Top Gear' (the BBC's most successful export) is in a Tuvan mayor's house - the house itself dwarfed by its giant satellite dish! 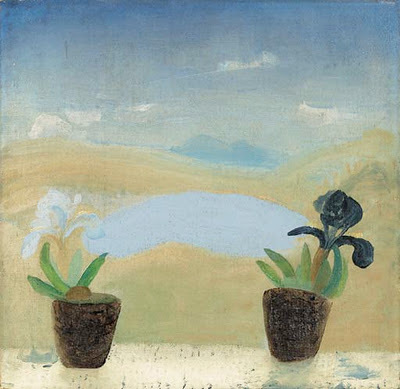 This is Iris, Tindle Tarn by Winifred Nicholson - a painting of her native Cumbria. It exhibits her essential qualities - an extraordinary feel for colour, here in shading delicacy, for flowers, especially domestically disporting on a window sill; and, an opening out into encompassing nature and light. The world is both domestic and wild and both are held in a transcending yet immanent order. The world is looked upon, and it is found to be good, an expression of a divine creativity. It is a creativity in which we participate when we 'decreate' ourselves (to quote Simone Weil), stand ourselves down, and allow the empty space we make way for to be suffused with a seeing that is, paradoxically, most deeply ours and utterly 'objective' - a radiance of things in themselves. 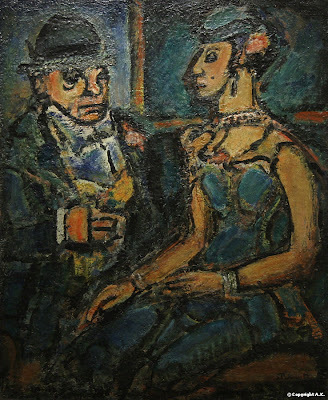 I have always treasured her work - both seen domestically, hanging on the walls of friends who knew her and were her friend, and in art galleries.